It’s a chilly, rainy Friday here in Ohio so I figured I’d get out one of my newer Hollywood castings and do a write up on it! I have been busy lately doing freelance car videos for a magazine (some of the stuff I’ll probably share here too - like coverage of the Trans Am Nationals!) and haven’t done a post in a while, so why not, right!? This is one of the lesser known Back to the Future Delorean castings, but in my opinion, it’s one of the best. Made by the brand Malibu in 2006/2007, it was part of their Reel Rides line. The line had some nice castings including a Smokey and the Bandit Trans Am, and the Plymouth GTX from Tommy Boy. I have a few of the other Malibu castings, but could not find the Delorean in stores or at the local toy shows...and from my research it looks like the Delorean was never released in the states (someone chime in here). So eBay it was. I picked it up for around $20 from a Hong Kong seller, and after a short shipping wait, I received this beautiful time machine. Now there is some tough competition when it comes to 1/64th scale Time Machines. The Johnny Lighting casting is decent, but lacks the correct wheels. The Charawheels version is amazing, and prices on those have stayed pretty high....but well worth it. The newer Retro Hot Wheels have given us some great Time Machines too, but nothing with as much detail as the Malibu or Charawheels have. I haven’t got the Tomica version yet, but it looks less detailed than the Retro HWs version. The Malibu version is scaled nicely, with many precision details throughout. The front headlights are clear plastic and not just a tampo, the front flux bumper is a separate piece from the body, there are mirrors attached, and it has a clock tower cable hook! One of my favorite features on the car....next to those amazing looking Delorean wheels. The tires are a bit too skinny for the casting, but that’s one of the few issues I’ve found with it. The side flux and cable details are good too, with little factory paint touches to help bring out that extra little bit. The taillights are beautiful and some may think that one area lacking is the license plate......but that is screen correct! The Delorean loses its plate in the parking lot of the Twin Pines Mall, and doesn’t get a new one until Doc visits the “future” of 2015. Nice little touch whether it was purposeful or not, ha! While the doors don’t open, there are still plenty of details to be seen on the interior. The dash has molded time circuit wires and boxes, along with a full array of other interior bits. Check out that detailed key lock tampo on the door too. 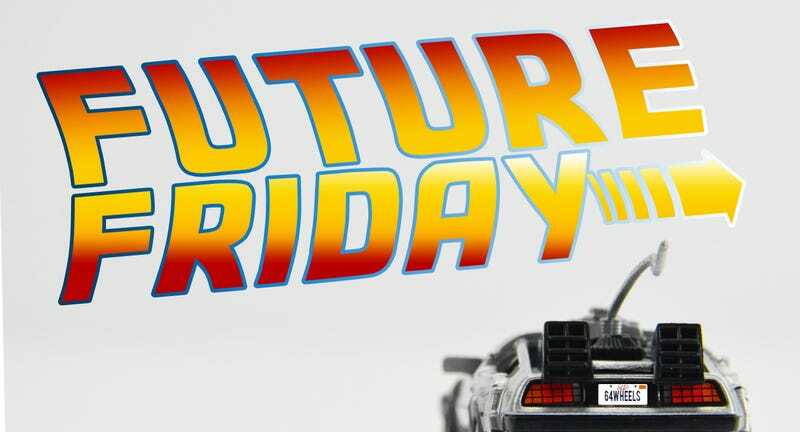 Overall, this is a very well done BTTF Delorean casting that I would highly recommend adding to your collection!